as you can see in the photos the motors are housed in there own little box i know the motors have got to be replaced as they have seen better days they are only speed 400 and i have 4 new ones under the bench or would i be better of taking the lot out and putting the motors in the main WTC? also in the photo you can see the red cradle that the original WTC used to sit in these are well spaced apart and may be of no use as i would like to put the main drive battery in the free flood area saves taking the WTC out all the time when im at the lake. You are going to have to think hard about your WTC arrangements, I would suggest. The motor box is very small the speed 400 just fit but the angle of the prop shafts are server so I would be drawing more current so it may be worth taking the lot out including the box. Another thing I'm going to have a look through all the old up scope articals I have from the 1990s that may have an idea. 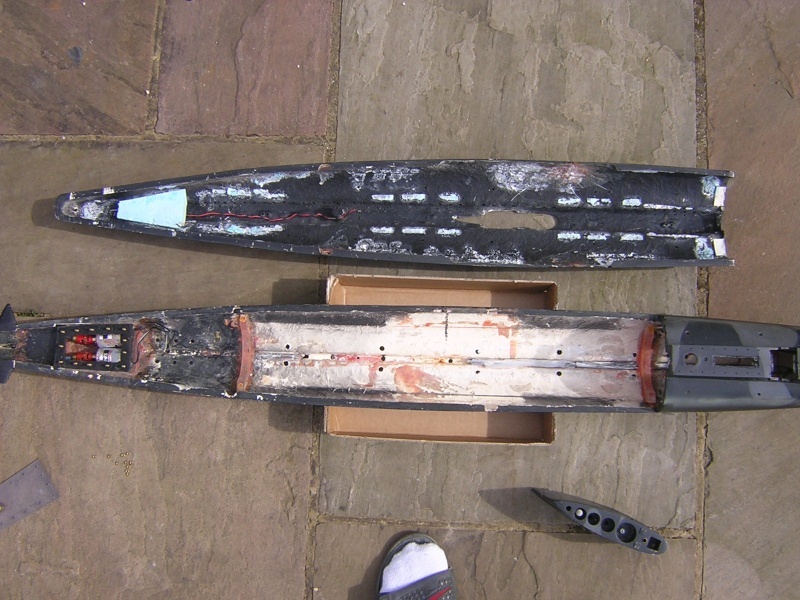 I think a lot of people worry about lipos but as long as you look after them and charge them correctly and use a lipo bag there should be no problem ive been using them for years in my model aircraft I have fitted a lipo the the uboat. Without any better information, I would work on a ballast tank volume of 1.5 to 2 litres. Positioned centrally (i.e under the periscope) or a little bit forward. To make the most of the ballast tank volume, keep the displacement of everything above the surfaced waterline as low as possible (i.e thin and strong). To minimise roll problems, keep the superstructure weight down. So the superstructure needs to be thin, strong and light weight! thanks for the advice might try and lighten the top from the underneath with a large sanding drum taking it easy not to build to any heat on the glass fiber. 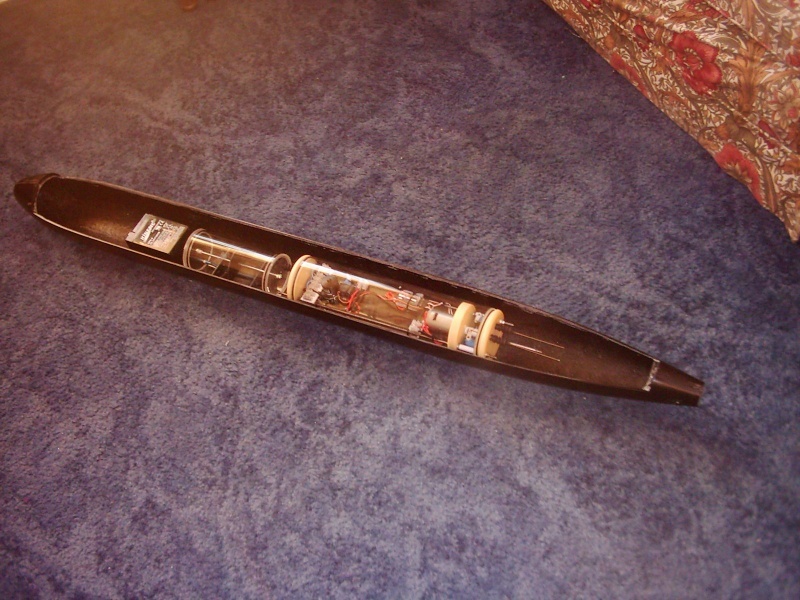 i had a look through the old upscope articals and came across a building artical of Paul Cooks Darnell S class submarine and he went into depth about the ballast tank. The ballast tank had a capacity of 1900 milliliters which was way to big but inside the ballast tank he had 2 200 milliliter air cans for the compressed air and a small can of airbrush propellant for emergency surfacing this i cant find out the size of plus there was a 25mm air gap at the top of the ballast tank to stop the compressor sucking in water. so may be a ballast tank of 1.2 to 1.5 liters may do the trick i feel i have read this some were on the internet about ballast tanks for darnell subs may be something ron perrot mentioned. one thing i have decided is im going to use a seal ballast tank so i will have to take into account the air gap for the air to commpress into. last question for today is it better to have a long thin or wide and short WTC the one that was in it was about 90mm wide. Tattooed you have now put the pressure on with your dad serving on HMS Sealion which this model has Sealion on the side of the cooning tower which im going to keep (i was told renaming a boat is bad luck and i need all the luck i can get) and yourself being christened on board how many people can say that brilliant. 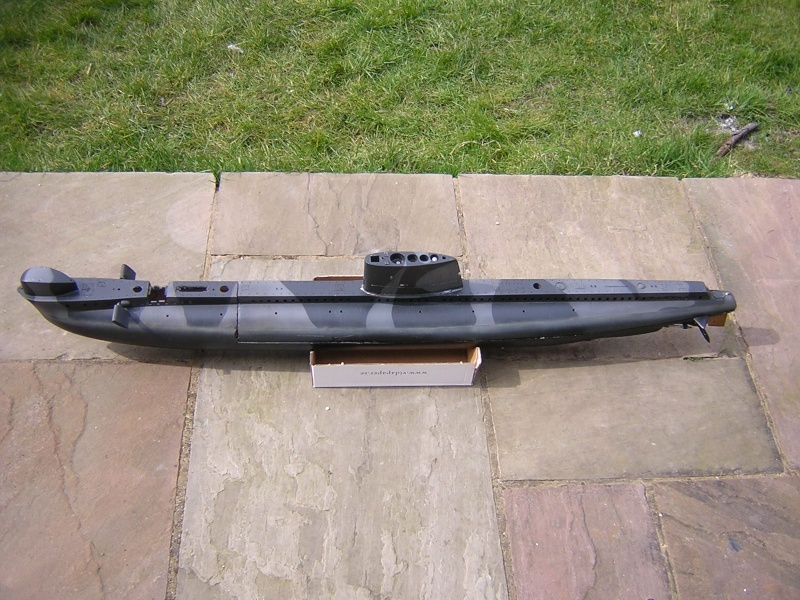 The colour scheme on my model i would like to keep as its a little different from just plain black does any one know if this was used on the full size submarine or were i could find out been hunting all over the internet and found nothing. That is very good information about the ballast tank (And now I remember the same article!) Paul is always available to ask but he is more active on our Facebook page. 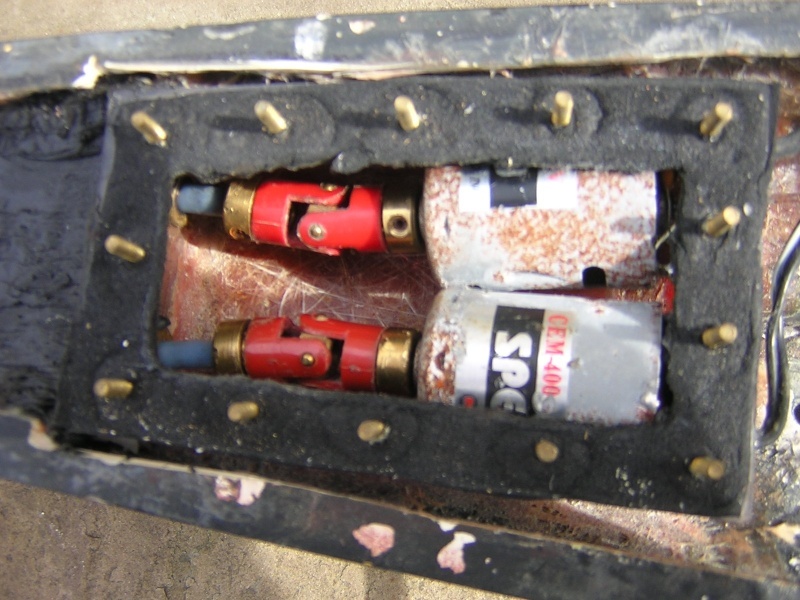 The pressure ballast tank is a very good and simple system. One of the few downsides is that you will only be able to get it 2/3 full, with the gear type pumps we use. So the tank is bigger and more difficult to fit in. The required ballast volume you mention sounds about right. 2 litres is a heck of a lot and if you can trim back the superstructure that will all help. I would go for fat and short WTC if you see what I mean! You will be able to get in much more volume into your tank for the same distance (Diameter squared) Long and thin tanks can give "sloshing" type instability also. For the same reason I would recommend a ballast tank with baffles in it. Don't forget the smaller the WTC volume the lighter the sub. Sorry no idea about colour schemes! I’m looking to get a acrylic pipe from ebay 90mm outside dimension and 80mm inside dimension this has a 5mm outside wall is the 5mm outside wall over the top or would 3mm wall be thick enough? The end caps to the ballast tank and WTC i am going to ask Mark Model Boats to make them i am very pleased with the ones on my U-boat not a drip inside after 3 hours in the bath. Would there be any problems if the WTC and Ballast Tank being Separate ie the ballast tank held in by a strap under the conning tower and the WTC sitting behind it with a pipe running to the ballast tank to fill it with water. Hope he does not mind me using his picture to explain what im trying to say. Here comes another Question the pressures involved seem very high and im not sure if my building skills are up to it. In the old days they used a water prob in the ballast tank that cut of the compressor when the water touched them my thinking is when the water is pumped into the tank could the air be pushed into a separate air tank so when the water touches the probs the pump would cut this would lower the pressure in the system quite a lot depending what size air tank used when you want to surface reverse the pump and up she comes there is plenty of room up front for a air tank. No problem having the ballast tank separate. Personally I prefer a single end cap at the stern - makes things simpler, to me. 3mm or 5mm depends on the pressure but it looks as if you are backing away from higher pressure systems anyway. I was hoping someone with hands-on experience of a level probe would answer, but here goes. They are certainly used but maybe a little bit old-fashioned now. (I'm waiting to be shot down on this!) They were used in the Craycraft modules of many years ago. 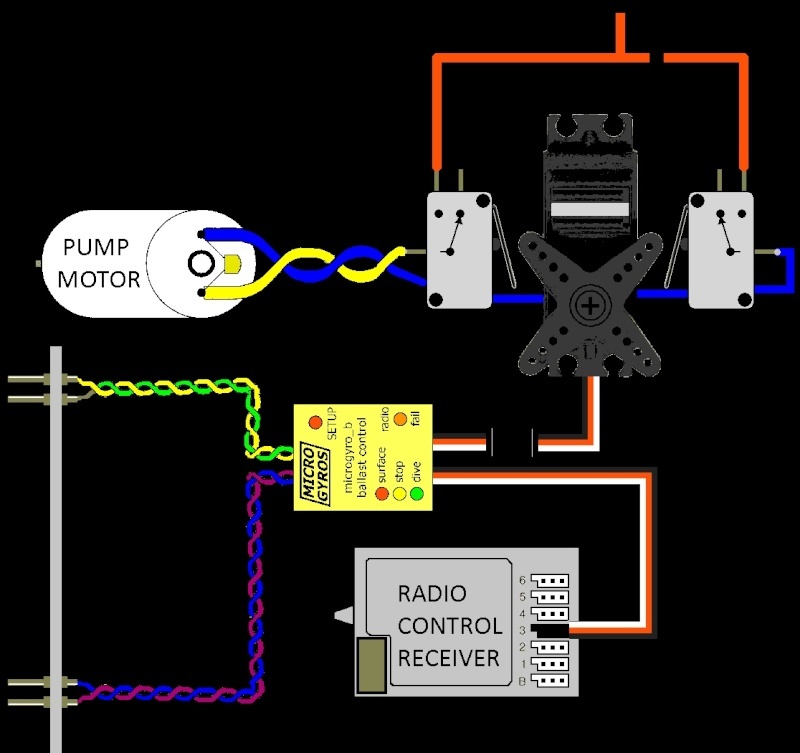 The important thing is that the probes are fed with alternating current (to avoid electrolysis) and the Microgyros ones are. I've met Mike S of Microgyros on many occasions (last time at Haydock Park this August) and I've used his speed controllers at least twice. So I can't see you having any problems with the product etc. Hopefully someone will answer who has used the actual Microgyros unit. It has been available for a number of years. Richard doesn't post on here now but you can find him over on the "Dive_In" Facebook pages. thanks David that cleared a lot up so i know im going in the right direction if im going with a module its going to be 3mm side wall for main WTC and 5mm side wall for balast tank. 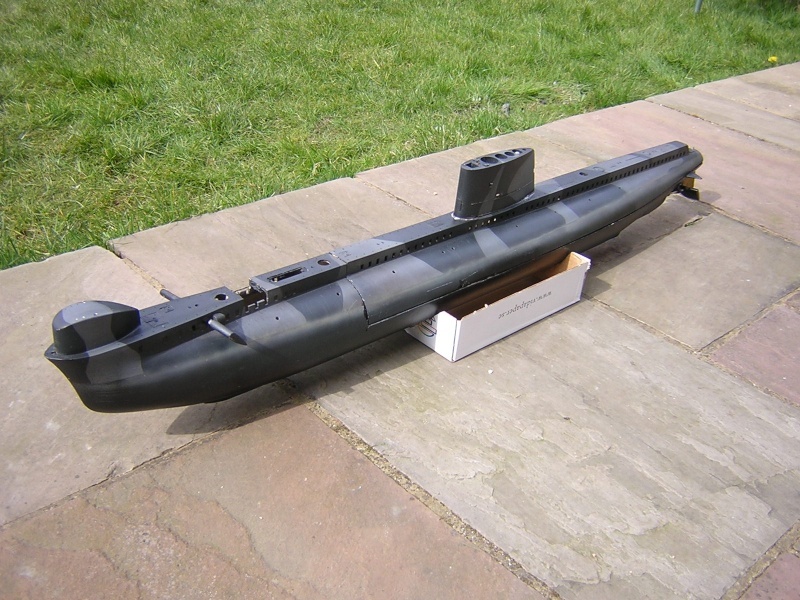 i can only get in a 300mm long WTC may not be big enough in the back between the ballast tank and back of sub so may need to have a front module as well. i have also been pointed in the direction of the Kavan fuel pump by paul cook this pumps 1.8 litres a min on 12 volt it is a bit bigger than the red/orange pumps. 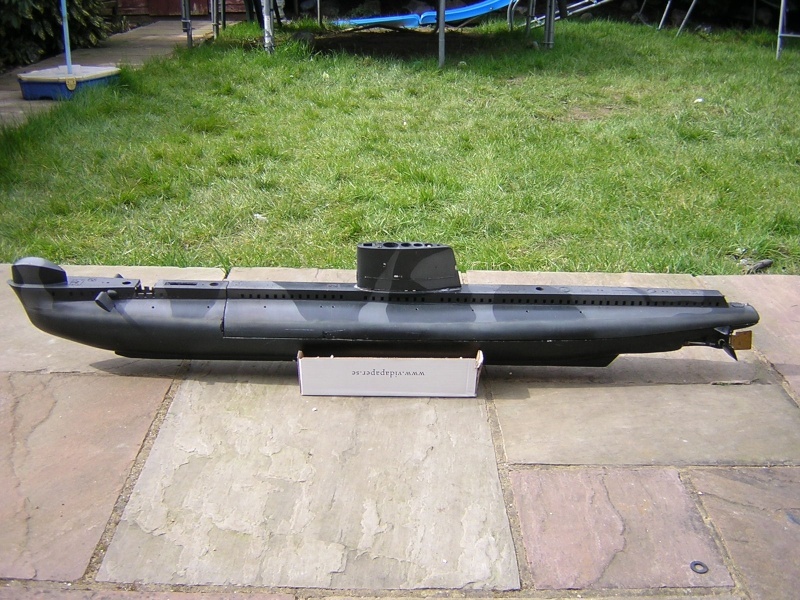 At the moment i am reading the book simply model submarines there is a lot of good information in it in particular paul cooks HMS satyr which uses boxes this i use on my fun sub with no problems a lot cheeper to make modules work very well but find it a fiddle getting the WTC out having to undo everything. on the subject of good information is the RC Submariner DVD from Traplets it goes into great detail on how subs work with out getting to technical . Yes "Simply Submarines" is a nice book and the Traplet DVD also - Paul C knows his stuff! thanks for that dave forgot i had that book as you say a good read.